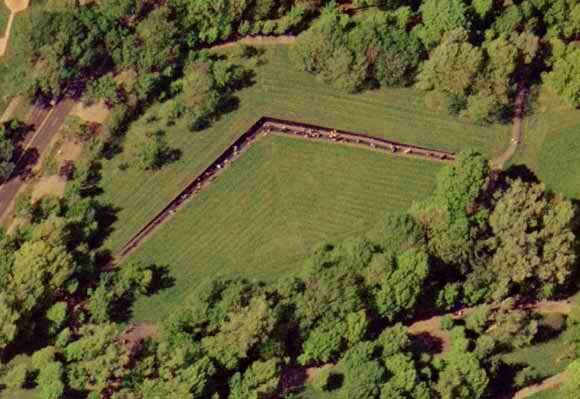 The Vietnam Veterans Memorial is a 2-acre (8,093.71 m²) U.S. national memorial in Washington D.C. It honors service members of the U.S. armed forces who fought in the Vietnam War, service members who died in service in Vietnam/South East Asia, and those service members who were unaccounted for (missing in action, MIA) during the war. Its construction and related issues have been the source of controversies, some of which have resulted in additions to the memorial complex. The memorial consists of three parts: the Vietnam Veterans Memorial Wall, completed first and the best-known part of the memorial; The Three Soldiers; and the Vietnam Women's Memorial. The main part of the memorial, which was completed in 1982, is in Constitution Gardens adjacent to the National Mall, just northeast of the Lincoln Memorial. The memorial is maintained by the U.S. National Park Service, and receives around 3 million visitors each year. The Memorial Wall was designed by American architect Maya Lin. In 2007, it was ranked tenth on the "List of America's Favorite Architecture" by the American Institute of Architects. As a National Memorial, it is listed on the National Register of Historic Places. This wall containing the names of numerous soldiers who died during the Vietnam wars as well as those who were lost in action. The memorial is a nice dedication to these people, as they show the sacrifice it takes for freedom. It's heartbreaking to see the number amassed of those lost. I'm happy to see them honored. The monument is cut into a hill. Guidebooks are present near the entrances to help you find a specific name. Walkway is kinda narrow, but the dedication it took to build and preserve the monument shows how we honor our troops. A must see in the capital. Be prepared to take your time and truly soak in the emotions here. Absolutely beautiful! I visited this memorial when I was in my early teens. Honestly I was not prepared for the overwhelming feelings. I had been taught about the war but truly did not understand the amount of lives lost. From a young adults perspective not understanding the total cost of war it was tough. I cried without personally knowing anyone on the list. After I returned home I looked into family members who had fought during this combat and I have a much greater appreciation for the loss. Please take time to go see this memorial in person if you ever get the chance. Vietnam wall was Built in 1982. To honor our troops. That where killed in action in Vietnam. When you visit the wall go once in the morning and come back at night when it's lite up. Its amazing. Beautiful memorial. There were a few honor flight groups going through when we were there. Listening to their stories brought tears to my eyes. Very impressive memorial. Simplistic design, but so powerful in meaning. Incredible place to visit. You can see and feel the connection of the people which have relatives and friends on the wall. The polished granite is beautiful.